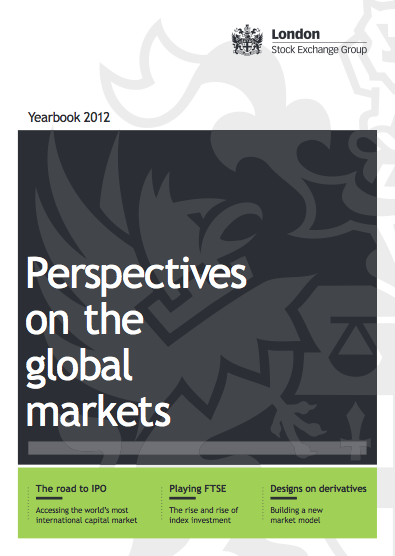 The London Stock Exchange Group Yearbook 2012. Original article here. Taking matters into your own hands and being in charge of the investment experience can be a powerful draw for private investors. Getting to know a company’s offerings, their competitors, the elements driving the industry and the management’s plans can be a satisfying way to make money, be it through capital gains or dividend returns. And as pension provision is rapidly becoming the responsibility of the individual, savers with a long-term horizon are increasingly looking to the stock market as a means to generate real returns over the longer term; the return on risk-free assets such as deposit accounts has fallen far below historic norms and may not improve for many years, according to the 2012 Barclays Equity Gilt Study. 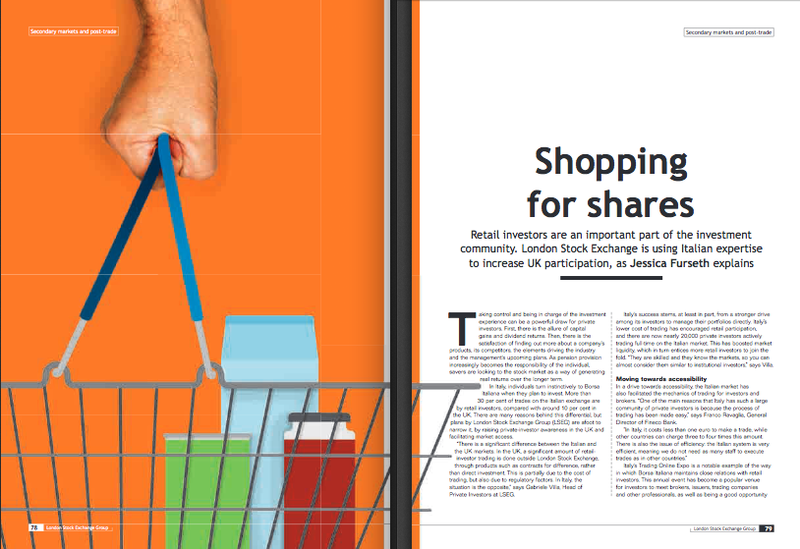 The London Stock Exchange Group (LSEG) is working hard to come first in retail investors’ minds. In order to achieve this, the LSEG has taken lessons from Borsa Italiana and its enviably large retail investor community; over 35% of the trades on the Italian exchange are made by retail investors, compared to around 4% in the UK. Italy’s Trading Online Expo is a notable example of the way in which the Borsa Italiana maintains close relations with retail investors. This annual event has become a popular venue for investors to meet brokers, issuers, trading companies and other professionals, as well as an opportunity to learn more about the various financial products available. In London, the LSEG has adopted a similar practice with its London Investor Show, intended to become a keystone event in the private investor calendar. “Education of private investors is fundamental. At Fineco Bank we hold webinars and classes, and we organise a lot of meetings for clients,” says Ravaglia. He believes other countries wanting to improve their private retail investor communities need to lower the cost of single trades. While this means accepting lower income per trade, Ravaglia points out that the Italian marketmakers are managing to be successful with this model. Furthermore, clients are often willing to pay for educational events and meetings, meaning there is an appetite for value-added offerings. ‘Live Meetings’ is a new service by Borsa Italiana where private investors can access a video feed from conferences or analyst meetings with company managers. Investors can even submit questions for companies ahead of time, and get answers during the broadcast. “This encourages the relationships between the companies and the investors,” says Villa, adding that the LSEG is working on creating a similar offering in the UK. When looking at the differences between the Italian and the UK system, you may be excused for wondering whether the UK system is inherently more conservative; it lags behind especially with online offerings and interactive services. Villa, however, does not think it is a question of being conservative, more the fact that the vast majority of its customer base are institutional investors, hence the LSEG has focused on catering to these. “Since the merger of the LSEG and Borsa Italiana [in 2007] there are elements from both which we are looking to expand to the other. For the UK, creating a different approach to private investors is the focus,” says Villa. The responsibility to strengthen ties with retail investors also extends to the companies themselves. While larger businesses often have more a more structured focus on services for retail investors, this is perhaps even more important for small companies who need the added liquidity. “Excellent websites are vital in providing as much as information as possible for retail shareholders. It is the key window into a company which enables all shareholders to access directly the complete picture on the business, the management team, the strategy and overall investment case,” says Adrian Duffield, managing partner of technology, media and telecoms at College Hill, the business communications consultancy. One example of how this can be done is engineering group Costain. On its website, the £136 million cap provides video updates from its chief executive officer, in addition to well-made graphics presentations on its service offerings and how this meets the needs of industry developments. Investors can view the most recent analyst presentations, and Costain will also let attendees at the Annual General Meeting see the materials made for their City analysts. Efforts like those demonstrated by Costain are important to promote a sense of trust for investors. Similarly, companies who employ best practice communication strategies from the time of their market flotation will find retail investors to be curious about new market entrants. those willing to answer questions will look more attractive than those who do not. Emis, the healthcare software provider, was forthcoming when it joined the market in 2010, providing a timetable, a breakdown of the float financials as well as ample explanation as to the group’s intention for growth. The Yorkshire business also keeps a Twitter presence where it not only publishes news but also responds to queries, a feature which makes the group appear open and approachable. An alternative method for companies to keep on investors’ good side is to offer discounts on its products. This is the case for the shareholders of retailers Marks & Spencer, Signet Jewellers and the Restaurant Group, whose eateries include Garfunkels, Chiquito and Frankie & Benny’s. The likes of Unilever and Associated British Foods hand out baskets of products, while shareholders at Persimmon get 2% off the price of a new home. Perks such as these are mostly provided on the condition of investors holding a certain number of stocks; the Persimmon discount only applies to investors sitting on 1,000 shares for one year. While treats like these are nice, they should come in addition to, not instead of, thorough financial information; after all it is the performance of the stock and not the fruit basket that will make the crucial difference for investors’ wallets. Posted on 06/04/2012 by Jess. This entry was posted in Investment and the market. Bookmark the permalink.